The search for housing that is healthy, affordable and environmentally responsible has increased over the past few years, leading to a growing number of people taking a fresh look at old building techniques long shunned by the modern construction industry. Dharshana Ranatunga, Managing Director Eco Ceylon Holdings Ltd, makers of 'eco brick' an environmentally friendly and flexible building material, says the demand for such products are on the rise with old methods catching up fast with more and more people. "The eco brick's unique interlocking design eliminates the need for the traditional mortar preparation used in building construction," he told the Business Times, settling in for a long chat at his house at Thalawathugoda, which was also built using these bricks. When the Business Times observed this building, the first thought that crossed the team’s mind is that perhaps the best reason to build with these brick earth is the boost it can give to the health of the planet. Earth is an unprocessed, widely available building material with virtually no side effects associated with its harvesting or use. Explaining further, Mr. Ranatunga said that earth construction is an ancient technique which has been refined over time. "The bricks once laid with a sludge made of cement and soil looks and feels better than traditional brick work eliminating the need for plastering," he explained. When asked how he came across the idea to develop this brick, he said that his passion for the environment and wanting to build his house with earth had led to him for discovering this method of construction. "When I was researching to build my house, I came across this technology," he added. 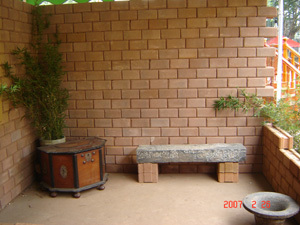 He noted that this technology was acquired from South Africa and that these bricks had a unique feature of interlocking. “This makes it sure that sand is eliminated when bonding two bricks together,” he explained, adding that a hydraulic machine using South African technology is used in the manufacturing process. Apparently the plusses for using these bricks rather than the traditional ones are many. “Since an earth-walled building saves construction and energy resources, doesn't pollute, and lasts practically forever, it is a wise investment," Mr. Ranatunga explained. He noted that the ability of an eco brick wall to store energy for long periods of time results in interior temperatures that change very little from day to night. Earth walls absorb solar energy during cold days and then re-radiate that energy to offset night time heat losses within the building. In the hotter months, the mass of the walls absorbs excess heat generated during the day, keeping the inside spaces surprisingly cool, then releases that stored heat to the clear night sky. In a properly designed and oriented building, this can mean significant savings in heating and cooling bills. And because the energy that controls the temperature inside the building radiates directly from the mass of the walls, the quality of the comfort inside is noticeably different than in a space regulated through mechanically altered air. He noted that the ability of an eco brick wall to store energy for long periods of time results in interior temperatures that change very little from day to night. Also the bricks are high quality with high strength, uniform size and shape, while they don’t require any non-renewable resources for production. "They are eco friendly and utilise wastes and local resources. 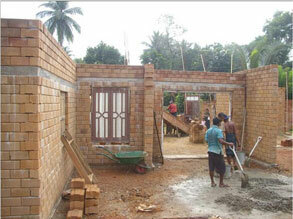 The structural performance can be engineered as per application," Mr. Ranatunga noted. One of the most appealing aspects of a house with thick eco brick walls is the indescribable feeling you get just being inside. There is a certain calmness that simply can't be duplicated with lightweight building materials, no matter what thearchitecture. Whether it is simply the energy of thermal mass, the healthy air of a natural environment, the quiet that results from the sound absorbing nature of the solid earth, or some other less identifiable quality, makes it something. Mr. Ranatunga added that houses constructed with interlocking eco bricks will cost slightly more than a comparably designed house with cement blocks. How much more they cost will depend on one’s site, the height and complexity of the wall system, the available soil, and the seismic safety factors. Mr. Ranatunga added that the company also proposes to venture into environmentally friendly material to augment its current offering to the market.